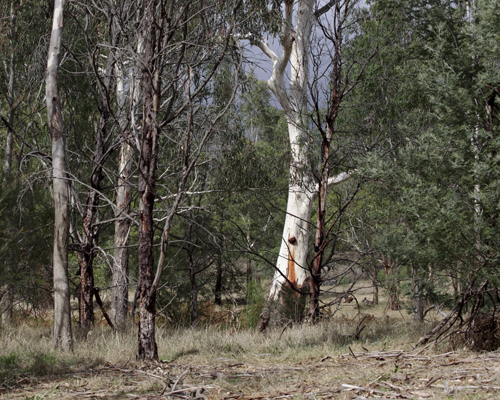 Westerfolds Park, a 120 ha area of native bushland with mown grass areas and tracks, is surrounded by suburban Templestowe. It provides habitat for native animals and a recreation place for people. On the north and west, the park is bordered by the Yarra River. The photo above shows a Tawny Frogmouth nestled into a fork of a Eucalyptus tree. The following photos were taken during a BirdLife Melbourne beginners outing. The day was mild with some welcome sunshine and calm at times, but windy at others. We recorded more than 30 bird species. After a morning spent walking in the northern section of the park, we drove to Banyule Flats for the afternoon. afternoon or evening, but It remained dry while we were at the park. 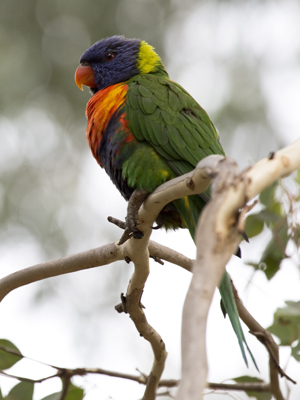 Rainbow Lorikeet in a tree by the track.